Now decide... are you with Jesus... or with His enemies? For example, look at the first Station of the Cross... Jesus Christ standing before Pontius Pilate. Jesus, the Son of God and a man without sin, is being judged by Pilate, the Roman ruler of Judea. Pilate is a man guilty of many crimes; Jesus is a man who has gone around doing good. The man on trial is the Son of God, but His hands are tied like a common criminal. Two guards stand behind Jesus and a soldier is in front of Him. Sadly, Jesus is alone with no friends present to defend or comfort Him. Pilate is washing his hands... to indicate he wants nothing more to do with this matter. He has not found Jesus guilty of any crimes. 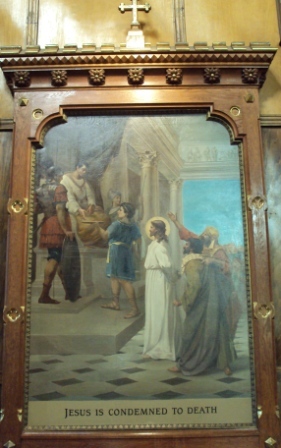 To prevent a riot, Pilate allows the Jewish leaders to take custody of the prisoner. Christians know the rest of this sad story. Jesus is cruelly whipped by the Roman soldiers, mocked and crowned with thorns, forced to carry a heavy wooden cross and finally crucified and left to die on the cross. Seeing Jesus silently standing there before Pilate... and knowing what He suffered... makes us realize how much Jesus loves each one of us. The image of the suffering Jesus will strengthen our love for the Man of Sorrows. We determine to love Jesus and to resist our temptations. 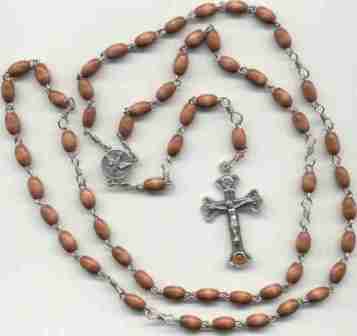 Stay close to Jesus by practicing Quiet Time and saying the rosary. You live in God’s presence and He is witness to everything you say and do. Why are you tempted? There may be certain persons, drinking places, or Internet sites that tempt you. Avoid them. Recall the pain and regret caused by giving in. When the temptation enters your mind... simply let a mild temptation drift out of your mind. For a serious temptation, try a prayer method or a favorite activity. Sin is not just a personal defeat. Jesus Christ, the Son of God, suffered and died on a Cross because of our sins. By resisting temptation, you are telling Jesus that you value His friendship and love above everything else. Jesus gave us the power — in His name — to overcome all unclean spirits. In the name of Jesus Christ, and by His Power, I command all impure spirits to leave my presence. In the name of Jesus Christ, and by His Power, I command all impure spirits to leave my presence now. Holy Spirit surround my mind with your protective love so that no impure thoughts may enter. Mary, Mother of Jesus, help me. Jesus be my strength, for You know my weakness. This is not the person I want to be. to strengthen your determination to avoid sin. Carry a crucifix in your pocket or in your car. When you are tempted... look at Jesus hanging on His Cross.